Back in the days when raw milk was the norm and milk was delivered by the dairy to your door, milk was a beloved and healthful beverage. After all, Mother’s milk is the first food for new-borns of every mammal species. It is considered a “perfect food” because it contains all the basic nutrients essential for life, including health-supporting microbes (probiotics) that protect the newborn from disease. Many people argue that milk was never intended for consumption by adults, yet there is evidence of the importance of raw milk for all ages, dating far back in history. Includes: 1. Health Benefits of Milk; 2. What About Sour Milk; Won’t It Make Me Sick? 3. What About Lactose Intolerance? 4. What About Milk Fat–Won’t It Make Me Fat? For a printable pdf copy of this article, see Milk: A Real, Raw, Natural & Perfect food. Perhaps the greatest health benefit of drinking raw milk is its great nutritional value, being nearly a perfect food, especially when it comes from pastured diary animals. It contains highly available vitamins, minerals, carbohydrates, fats, and proteins. It also contains viable enzymes that help not only to digest milk, but also to assimilate the other nutrients available in the milk. Lactase: digests the sugars in milk (lactose). Lipase: breaks down fat molecules so the components can be absorbed. It is also essential for proper absorption of fat-soluble vitamins A, D and K present in the milk. Phosphatase: required for the absorption of calcium and other minerals in the milk and from other ingested foods. All of these are present in raw milk, but not pasteurized milk (1). > Raw milk contains other vital important proteins in two fractions: casein and whey. When milk sours and separates, the casein fraction forms the curd, and the whey fraction is the liquid. Casein is a complex that provides amino acid, carbohydrates, and the minerals calcium and phosphorous. However, in ultra-pasteurized milk, the casein is denatured (its geometry is altered) by the high heat/pressure in such a way that it will no longer curd, and the calcium is no longer available for absorption. Ultra-pasteurized milk cannot be used to make cheese unless calcium chloride is added. The casein in raw milk or regular pasteurized milk (Vat and HTST) is not denatured in this way and is still bioavailable. Whey is the watery fraction of milk. Whey from raw milk is rich in probiotics, which help to digest complex carbohydrates (fiber) in the diet, maintain a healthy gut, and support a strong immune system. It is an abundant source of branched-chain amino acids (BCAAs) such as leucine, which are used to stimulate protein synthesis. In this way it works with casein to build strong muscles. The probiotics in whey are destroyed when milk is pasteurized; however, the culturing of pasteurized milk, as in the making of yogurt and kefir, introduces new (different) species to the whey fraction. The high heat/pressure of the ultra-pasteurization process denatures the proteins in the whey, making them harder to digest. The second greatest benefit is its immuno-protective value. Infants are born with little resistance to disease; what protects them from infection are the immune factors in raw mother’s milk. The same is true of raw milk from other sources as well: cows, sheep, goats, horses, water buffalo, yak, and so on. > Protection from bacterial contamination, such as salmonella and lysteria: Natural milk in the mother’s breast/udder is rich in nutrients and probiotic bacteria. These probiotics are beneficial to the health of the infant (and other consumers of the milk), imparting immune protection and other benefits. These good bacteria actually prohibit the growth and proliferation of pathogenic (bad, disease-causing) bacteria, as long as the dairy animals are clean and healthy when milked. Raw milk contains enzymes and antibodies that make the milk less susceptible to contamination by outside bacteria. For example, nisin and lactoperoxidase protect from contamination by salmonella and hysteria (11). In 1958, a salmonella outbreak in California was attributed to contaminated raw milk. However, repeated tests of the milk samples and of the herds that produced the milk could find no presence of the salmonella bacteria. During the 50 years following that outbreak, there were NO reported cases of salmonella in California, among people consuming raw milk (3b). > Protection from viruses: Raw milk also contains an anti-viral agent called ribonuclease. (Matthews, et al, in The Lancet, December 25,1976, pp. 1387 (3c)). > Treatment of ulcers: Raw milk has been the treatment of choice for many patients with gastic disorders, and especially ulcers, for centuries (4f, 10). However, modern medicine does not recognize this benefit, probably because they use pasteurized milk for their studies/conclusions. > Treatment of TB (Tuberculosis) and other disease: Raw milk has also been used to treat, as well as prevent disease. Hippocrates, the Father of Medicine, used raw milk to treat tuberculosis. Dr. J. E. Crewe, from the Mayo Clinic in Rochester MN, reported in 1923 that he uses raw milk extensively in the treatment of disease (10). Note however that this ability is lost when the milk is pasteurized. (Certified Milk Magazine, January 1929. not available on-line) (3a). > Treatment and prevention of asthma: Raw milk has also been shown to treat and prevent asthma. A recent Swiss study of nearly 15,000 children in 5 Euorpean countries clearly found that the one, single factor that reduced asthma substantially in all regions, was consumption of raw milk. Note however that this ability is lost when the milk is pasteurized. (The ‘Parsifal Study,’ Clinical and Experimental Allergy, 37, 661 – 670, M. Waser, et. al. ; www.ncbi.nlm.nih.gov/pubmed/17456213) (3g). Dr. Crewe (of the Mayo Clinic) postulates that raw milk might provide some hormonal benefit (10, 3a, 4f). (Note, however, that this ability may be lost when the milk is pasteurized). Thyroid: Patients with thyroid disease show marked improvement when given a diet containing raw milk. Prostate: Men with enlarged prostate observed rapid and marked shrinkage of the gland when treated with raw milk. Urinary tract: Urinary infections in women and men (even without affliction of the prostate), also showed marked improvement with a raw milk diet. An American doctor decided to try this technique for himself, in 1908. He immersed a beefsteak in raw buttermilk and let it sit for 13 years. He found that after those 13 years, it was in a state of “perfect preservation, showing not the slightest taint or decay.” This same doctor emphasized that this would work only with clean, raw milk, and not with milk that has been boiled or pasteurized (American Association of Medical Milk Commissions, Proceedings 15th Annual Conference, 1921) (9). None of these benefits survives ultra-pasteurization. NOT ONE. While simple pasteurization (Vat or HTST) does preserve some of the benefits of raw milk, many are lost; and all are lost from ultra-pasteurization (the method used by most commercial dairies). Encourages the growth of harmful bacteria (4c). Why is Milk pasteurized? What harm will come from drinking pasteurized milk? Refer to my articles: Why Pasteurize Milk? (12a) and The Problems with Commercial and Ultra-pasteurized Milk (12b). What About Sour Milk; Won’t It Make Me Sick? Raw milk sours – cultures/ferments – naturally, producing lactic and other short-chain fatty acids such as butyric acid. The probiotic bacteria naturally present in the raw milk culture it into a new, healthful product, with a slightly sour, zingy taste (as in yogurt, buttermilk, sour cream, etc). In many cultures, sour milk is given to invalids because it is an easily digested form of protein. It has also been used as a laxative, gently stimulating the gut’s muscles to action (13). 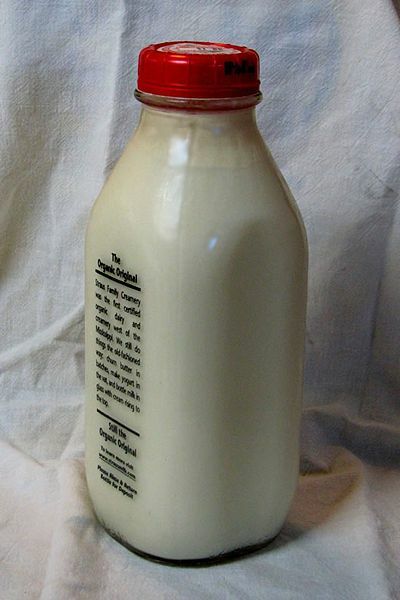 Unlike raw milk, pasteurized milk does not sour; instead, it spoils – putrefies – producing a “foul slime and puss that must be removed before the product can be ingested.” Putrefied pasteurized milk will make you sick, but naturally soured raw milk will not (2). The same probiotic bacteria that cause milk to sour also protect the fresh raw milk from pathogenic bacteria to which it might be exposed. Once it is pasteurized, killing not only the bad but also the good bacteria, the milk is more susceptible to contamination and putrefaction (2, 4). See Why Pasteurize Milk? for more on this topic. Many people are unable to consume milk because of lactose intolerance. This allergy causes severe digestive, and sometimes also respiratory, upset. It happens because they lack the lactase enzyme that breaks down lactose (milk sugar), or have insufficient good bugs in their gut to digest the lactose into the beneficial lactic acid. Many lactose intolerant people are able to consume milk if they supplement with lactase enzyme. Often, the lactose intolerance disappears if the afflicted person switches to raw milk. This is because raw milk contains probiotic bacteria that produce natural lactase, the enzyme that converts lactose to lactic acid. The pasteurization process kills the natural good bugs present in raw milk that convert the lactose into beneficial lactic acid. Those who still suffer from lactose intolerance, even after switching to raw milk, can often tolerate raw goat’s milk. Milk is organized into globules of molecules that must be broken up in the digestive tract, before the nutrients can be digested. Goat’s milk, like human milk, has smaller, more readily broken-up globules than cow’s milk, and thus is more readily digested. What About Milk Fat–Won’t It Make Me Fat? The rich fat in milk is called butterfat. It is 63% saturated, 32% monounsaturated, and less than 1% polyunsaturated. 12-15% of the saturated fats are short and medium-chain fatty acids, a special class of fats that are digested differently than the longer chain fatty acids. Many have beneficial properties such as protecting us from disease, and stimulating the immune system. The benefits of monounsaturated (omega-9) and polyunsaturated (omega-6 and -3) fats are already well established. Butterfat from grass-fed (pastured) cows contains conjugated linoleic acid (CLA), a polyunsaturated fat that has remarkable properties, such as cancer prevention, and plays a role in weight control. A cortisone-like factor that prevents stiffness in the joints (arthritis), is also present in butterfat. This factor is heat sensitive, and is destroyed by the heat of pasteurization. If non-homogenized milk is allowed to rest, the butterfat will rise to the top, forming a layer of cream above the protein-rich watery layer. The natural, fat-soluble vitamins A and D present in raw milk are removed if the cream is skimmed from the milk. These vitamins are destroyed by pasteurization, so commercial milk is fortified with synthetic vitamins. Old-fashioned cows allowed to graze in grassy pastures produce milk that is over 4% butterfat; modern commercial holsteins produce milk that is less than 3% butterfat in “whole” milk, and even less in low fat or skim milk. Many “experts” claim this lower fat content is a plus, but the truth is that one cannot receive all the benefits of raw milk without the presence of the full complement of butterfat. It’s a mute point with pasteurized milk, since most of the nutritive value of the milk is lost. While most Americans believe that eating fat will make them fat, they are, for the most part, wrong. Oh yes, if they over-consume any kind of food, they are likely to gain weight. But the more common culprit in weight gain is overfeeding on carbohydrates, especially simple carbs like white flour and sugar, which are converted in the liver to fats for storage in the body’s fat cells. The fat stored in our fat tissues is made primarily from excess dietary carbohydrates, not dietary fat. Dietary fat is put to much more immediate use, such as to protect our nerve tissues, and to be incorporated into the membranes of every cell, providing a barrier to unwanted intruders. Or it can be burned as fuel for muscle and brain cells, instead of burning carbohydrates; this is the basis of Paleo diet, low-carb and ketogenic dietary recommendations. But, what about saturated fat? you ask. Isn’t it bad for you, and isn’t milk fat full of it? Yes, milk is high in saturated fat. You probably will not believe me when I tell you that saturated fat is not bad for you; you’ve been so well indoctrinated by the media, the corporate agriculture lobby (who want to create a market for their vegetable oils, at the expense of animal fats like butterfat), and your doctors who have been swayed by by the same influences, and also by the pharmaceutical reps.
Perhaps, if you won’t believe me, you might believe the cover of Time Magazine, June 12, 2014: Ending the War on Fat (8). See also my article on The EssentiaList: Butter (and other saturated fats) is a health food! (7). If you want to learn more, see my article on Saturated Fats. This entry was posted in Dairy and tagged milk. Bookmark the permalink.